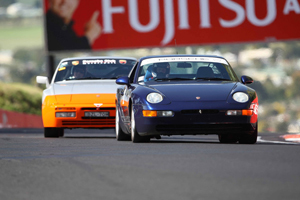 The Porsche Category Regularity event will be held as part of the 2016 Bathurst Motor Festival, an event which will be held under the International Sporting Code of the FIA and the National Competition Rules of CAMS - CAMS Permit No. 816/2703/01. The CAMS guidelines stipulate that the slowest car should be no more than 130% of the fastest nominated time. Further, under specific regulations for the Mt Panorama Circuit, there is currently a minimum lap time (fastest accepted) of no faster than 2:37. Once final payments have been made (Mid Feb) we will only refund the entry fees if an replacement is found. This is because we will have already paid the organisers. Since this is a Porsche Marque event, only cars of Porsche make and model may enter.